Asia Society’s Center on U.S.-China Relations is excited to announce the official launch of ChinaFile, a new English-language online magazine on China. ChinaFile seeks to foster an informed, nuanced, vibrant public conversation about China and its place in the world. ChinaFile publishes original reporting and analysis in print, photography, and video on a wide range of subjects. They also translate and archive outstanding content from a growing list of partner publications in China and around the world. Features that may be especially useful to educators include short videointerviews with authors of newly published books on China, a searchable database of reports on China from dozens of research and advocacy organizations, and our archive of five decades of writing on China from The New York Review of Books. 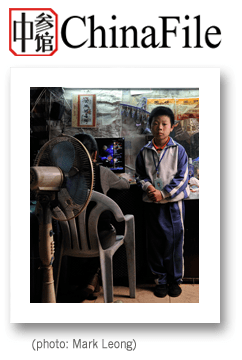 The editors of ChinaFile put special emphasis on visual storytelling and publish long-form photo essays as well as short documentary films. They invite you to explore the new website, and welcome feedback on how ChinaFile can be even more useful to students and teachers.